El Palacio de San Benito, small, gorgeous, full of antiques and with an old-fashioned, Home and Garden-type charm is in an equally lovely small town in the heart of a Natural Park. A great escape an hour’s pleasant drive from Seville airport. From heading through the hefty old wooden door and entrance to opening the door onto a world of interiors! Antiques, beautiful old tiles, and views to the lovely open patio with seating, tinkling fountain and an abundance of plants I was won over. Could I stay? Forever? San Benito is part XV century and part new, see if you can tell the difference! Built as a family home and chapel it remains in the same family today. Beautifully preserved, maintained and enlarged it has many original and charming features. Each bedroom is uniquely designed and decorated, mine had a four-poster bed with matching cot and a delighful tiny patio with its own water feature. All have interesting features and are furnished with antiques as expected when you learn the owner is also a stage set designer. Or book El Palacio immediately via Booking dot com. 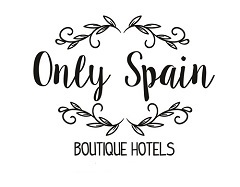 Have you visited a great hotel in or around Sevilla that you’d like to recommend?